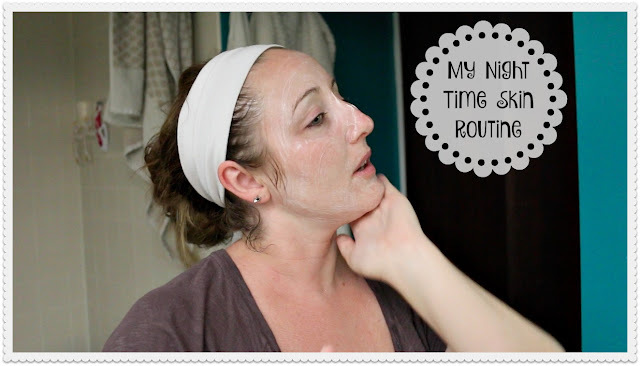 Since last week I did my Morning Skin Routine, I thought this week I would show you my Night Time Skin Routine. 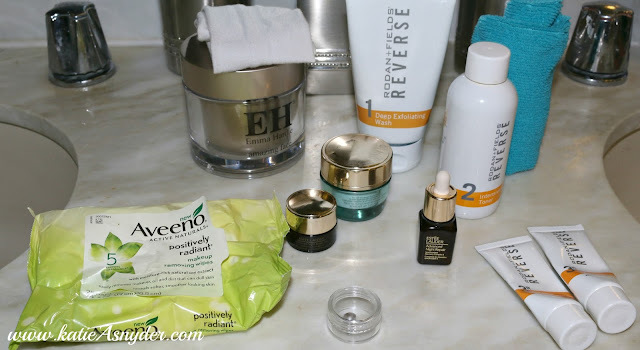 A lot of the items I use in my Am are repeated in my PM, according to the skincare goddess Caroline Hirons, thats ok, there are a few items we should change up, like our serums, and eye creams, but also like she said everything is dependent upon budget, as I didn’t have a huge budget to put toward my skincare there are the repeats, but I still feel like it’s a good skin care routine. I start with the Aveeno Positively Radiant Wipes, these are great for starting the process of removing makeup, I would never use one of these wipes in place of washing my face, as your just moving makeup around your face, as well as the oil used in the wipes to remove makeup should be removed as well. Then I use my Emma Hardie Amazing Face Cleansing Balm, I usually allow this to sit on my face whilst I brush my teeth, but I didn’t think any of you would care to see that so I did my teeth before this. The reason I like to let this sit, is my skin is so dry, and I notice a huge difference in my skin when I allow to sit for about 3 minutes. I then wet my hands and massage the oil into my skin, I do not throw a ton of water on my face and everywhere else, simply wetting your hands is enough. I then use a microfiber washcloth (Bought a set of 12 from Ross for about $10), that is lukewarm to remove the cleansing balm. I then use the Rodan+Fields Reverse Exfoliating Face Wash, I again apply straight to the face, then using wet hands massage it into the skin, then using the same washcloth that has been rinsed in lukewarm water remove it. Now I use my Rodan+Fields Reverse Toner on a cotton pad, this is used on my face, neck, and chest area. Then it’s time for eye cream I am using the Estee Lauder Advanced Night Repair Eye Gel. At night I apply this under the eye, on the lid, going up to the brow bone, and winged out at the temple. Then I use the Rodan+Fields Dual Active Brightening complex. Followed by the Estee Lauder Advanced Night Repair Serum. I then use the Estee Lauder Nightwear Plus Cream, this smells like cucumber and is really moisturizing. And finally I finish with the Rodan+Fields Lip Serum, this stuff is so amazing, I would recommend when using it to actually massage it into your lips rather than glossing over really quickly, you will notice a huge difference in the softness and appearance of your lips if you do. What are your favorite night time skincare items? Also here is todays Main Channel Video and Daily Vlog!